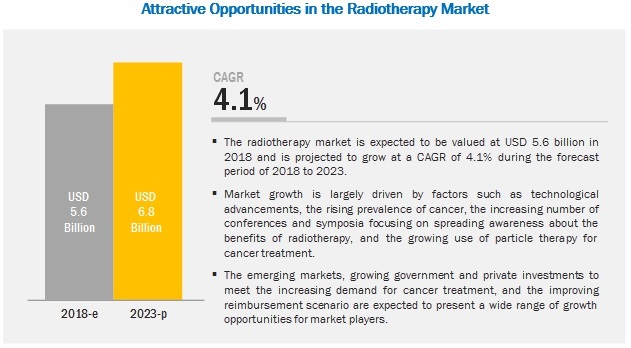 [226 Pages Report] The radiotherapy market is projected to grow from an estimated USD 5.6 billion in 2018 to USD 6.8 billion by 2023, at a CAGR of 4.1% during the forecast period. Market growth is largely driven by factors such as technological advancements, the rising prevalence of cancer, the increasing number of conferences and symposia focusing on spreading awareness about the benefits of radiotherapy, and the growing use of particle therapy for cancer treatment. The emerging markets, growing government and private investments to meet the increasing demand for cancer treatment, and the improving reimbursement scenario are expected to present a wide range of growth opportunities for market players. Based on type, the radiotherapy market is segmented into external beam radiotherapy, internal beam radiotherapy/brachytherapy, and systemic radiotherapy. The external beam radiotherapy segment is expected to grow at the highest CAGR during the forecast period. Growth in this segment can primarily be attributed to the reduced risk of radiation exposure in external beam radiotherapy and the increased precision and accuracy of tumor targeting in this therapy. Based on end user, the radiotherapy market has been segmented into hospitals and independent radiotherapy centers. The hospitals segment is expected to account for the largest share of the radiotherapy market in 2018 owing to the rising global prevalence of cancer, increasing installations of advanced radiotherapy equipment in developed as well as developing regions, increasing government initiatives aimed at equipping (or upgrading) hospitals with newer and advanced radiotherapy systems, and the increasing availability of funding for the adoption of advanced cancer treatment technologies. The Asia Pacific is one of the major revenue-generating regions in the radiotherapy market. China, India, and Japan are the major countries responsible for the high growth of this regional market owing to factors such as the increasing per capita income, improving healthcare infrastructure, and supportive government activities in these emerging countries. Furthermore, the increasing geriatric population, the growing incidence of cancer, and the rising acceptance of radiotherapy procedures and devices are also driving the growth of this regional market. Varian Medical Systems (US) is one of the leading players in the global radiotherapy market. Its broad portfolio of radiotherapy systems and brachytherapy products is the key factor accounting for its large share in this market. The company has adopted both organic and inorganic growth strategies such as agreements, partnerships, collaborations, product launches, and contracts to maintain its top position in the field of radiotherapy. The company is also focused on providing training and conducting workshops to increase the adoption of its products. In 2017, Mitsubishi Electric signed an agreement to transfer its particle therapy systems business to Hitachi and integrate into one entity. In 2017, Varian Medical Systems opened its new facility in Jundiai, Brazil. This expansion is aimed to increase access to advanced radiotherapy treatment in the country. In 2016, Varian Medical Systems launched an innovative treatment platform-Halcyon Treatment System. The product simplifies treatment delivery with high-quality plans delivered at significantly increased speeds. What are the growth opportunities related to the adoption of radiotherapy across major regions in the future? Emerging countries have immense opportunities for the growth and adoption of radiotherapy. Will this scenario continue in the next five years? What are the various cancer types wherein radiotherapy finds a high adoption rate? What are the new trends and advancements in the radiotherapy market? 12.2 C. R. Bard, Inc.
12.7 Mevion Medical Systems, Inc.
12.8 Optivus Proton Therapy, Inc.
12.9 Panacea Medical Technologies Pvt. Ltd.
12.14 Varian Medical Systems, Inc. The study involved four major activities to estimate the current market size for radiotherapy. Exhaustive secondary research was done to collect information on the market and its different subsegments. The next step was to validate these findings, assumptions, and sizing with industry experts across the value chain through primary research. Both top-down and bottom-up approaches were employed to estimate the complete market size. Thereafter, market breakdown and data triangulation procedures were used to estimate the market size of segments and subsegments. After arriving at the overall market size using the market size estimation processes as explained above—the market was split into several segments and subsegments. In order to complete the overall market engineering process and arrive at the exact statistics of each market segment and subsegment, data triangulation and market breakdown procedures were employed, wherever applicable. The data was triangulated by studying various factors and trends from both the demand and supply sides in the radiotherapy industry. Varian Medical Systems, Inc. (US), Elekta (Sweden), Accuray Incorporated (US), Ion Beam Applications SA (Belgium), ViewRay, Inc. (US), IsoRay Medical, Inc. (US), Hitachi Ltd. (Japan), Panacea Medical Technologies Pvt. Ltd. (India), Provision Healthcare (US), and Mevion Medical Systems, Inc. (US). Major 15 players covered. This research report categorizes the radiotherapy market based on type, product type, application, end user, and region.